Sweet roasted red peppers marinated in a savoury marinade and grilled along with some fresh mozzarella and basil in multi-grain bread. April is national grilled cheese sandwich month and I have been enjoying grilled cheese sandwiches all month long. I never seem to tire of grilled cheese sandwiches and I always enjoy playing around with new ones. This marinated roasted red pepper grilled cheese sandwiches was definitely one of favourites from this month! I started out by marinating some roasted red peppers in some balsamic vinegar, garlic, onions and herbs overnight to build up some flavour and then I threw them into a sandwich along with some fresh basil and cheese and grilled it up until the cheese melted. 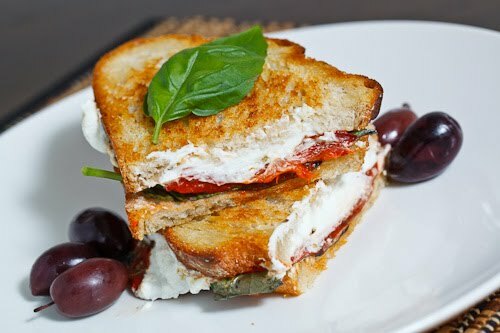 The first time I made this grilled cheese sandwich I went with a goat cheese which was an absolutely divine combination of sweet and tangy with the basil adding an amazing breath of freshness. While I was enjoying the sandwich I could not help but think that a fresh mozzarella version would also be good and with that thought, along with the desire to make another batch of marinated roasted red peppers to snack on, I had to try it. The marinated roasted red pepper and mozzarella grilled cheese sandwich was also fantastic with the milder flavours of the fresh mozzarella allowing for the flavours of the marinated roasted red peppers to shine through a bit more. Now I am torn, both options are so good! Assemble sandwich and grill until golden brown and the cheese has melted, about 2-3 minutes per side. 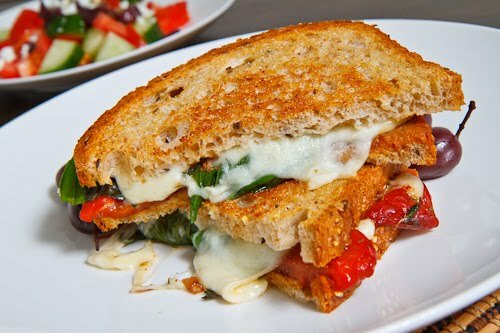 this is exactly how i love my grilled cheese…lots of peppers! Goat cheese is so delicious. Sounds incredible with roasted red peppers! A fabulous grilled sandwich! Those flavors are just marvelous. OMG it's so divine! I love melted cheese !! MHH have a nice w/end! Every component of this sandwich works together so well! A mediterranean masterpiece! I have totally missed out on grilled cheese month. But it's never too late to celebrate! there's nothing more that i love than marinated roasted red peppers, and grilled sandwiches… so delicious can't wait to try it! This sandwich looks so heavenlyyyyy 🙂 Beautiful clicks ! Cheesy, Gooey, heavenly goodness… I must eat this. Thanks for the idea! You can never go wrong with mozzarella!! As always, this looks amazing!! You are such an inspiring cook, and I always look forward to seeing what you've conjured up! Oh wow! I can't wait to try this! Kevin, so nice of you to bring this out for another look. Perfect timing too with the weather cooling off. The marinated roasted red pepper really seals the deal…bravo!